Appreciate nature from three breathtaking perspectives – Capilano Suspension Bridge, Treetops Adventure and the exciting new Cliffwalk. The 450 ft (137m) long, 230 ft (70m) high Capilano Suspension Bridge has thrilled visitors since 1889. 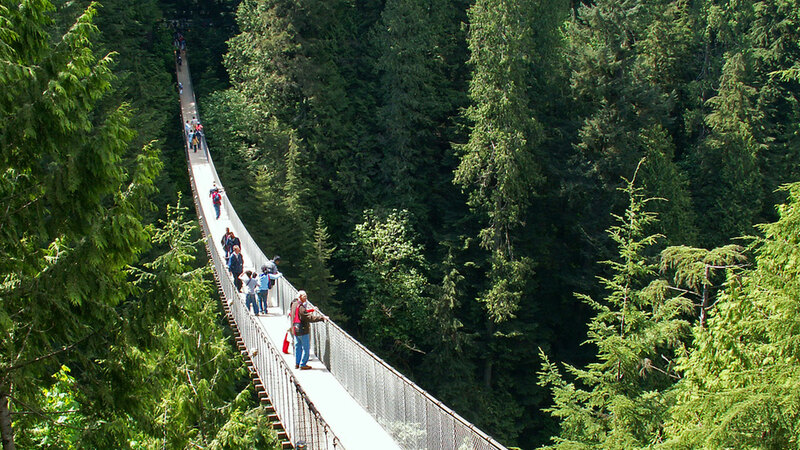 While the wobbly bridge and stunning location is a Vancouver landmark, Capilano Suspension Bridge Park offers an all-encompassing BC experience. History, culture and nature are presented in unique and thrilling ways with knowledgeable staff and interpretive signage providing as much, or as little, information as guests want. The new Cliffwalk follows a granite precipice along Capilano River on a labyrinth-like series of narrow cantilevered bridges, stairs and platforms through rainforest vegetation. With 16 anchor points in the cliff supporting the structure and two glass platforms, Cliffwalk is not for the faint of heart! Interactive exhibits demonstrate the need for water conservation. Treetops Adventure takes guests 100 feet into the mid-story of a coastal rainforest on seven suspension bridges attached to old-growth trees. It is accessible to guests age 2 to 92. Nature guides provide hourly tours, explaining the importance of a West Coast temperate rainforest to the ecosystem.